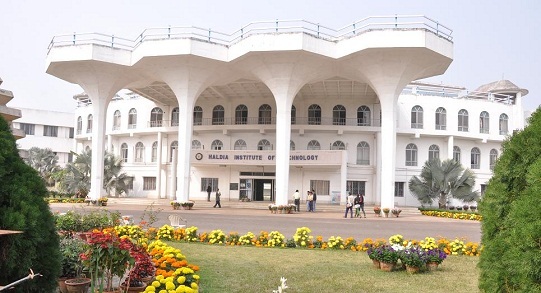 Haldia Institute of Technology started its journey in the year 1996 as the first self-financing and Govt. Aided Degree Engineering Institute in the the state of West Bengal, initially with three B.Tech. (UG) courses, viz. Chemical Engineering, Computer Science & Engineering and Instrumentation Engineering with 30 intake each. Presently, the Institute is offering 12 UG courses and 5 PG courses in addition to MBA & MCA. Students of the institute are provided with ample support throughout the year in order to prepare for on-coming campus recruitment drives by various companies. The Department of Management and Social Sciences also conducts round-the-semester Personality Development and Aptitude/Reasoning Test sessions for this purpose. These highly motivating classes are taught by experts from various companies, like Interactive Learning Services (Kolkata) and Globsyn. Further, many “HITans” proceed to pursue their higher studies after HIT. Students have gained places in premiere institutes like the IITs and IISC (Bangalore) in India, and New York University (US) abroad. The Training and Placement Office regularly holds meetings with the representatives of foreign institutes, e.g. the University of Sussex, to chalk out new higher education avenues for the students to take. Campus: Haldia Institute of Technology started its journey in the year 1996 as the first self-financing and Govt. Aided Degree Engineering Institute in the the state of West Bengal, initially with three B.Tech. (UG) courses, viz. Chemical Engineering, Computer Science & Engineering and Instrumentation Engineering with 30 intake each. Presently, the Institute is offering 12 UG courses and 5 PG courses in addition to MBA & MCA. 1. Library hours : 9.30 A.M. to 8.00 P.M.
2. Charging and discharging hours : 1.00 P.M. to 7.00 P.M.
3. Reference desks are provided. 5. OPAC (Online Public Access Cataloger) is available through out the library hour. 6. Book Bank Scheme : Each student is getting 4/5 books for the entire semester. 7. Computerized library information system :LIBSYS College Edition 4.00 . Yearly cultural festival – RIVIERA is organized where students and external team / celebrity perform. The programmer was inaugurated in presence of Hon’ble Chairman Mr. Lakshman Seth, Mrs. Tamalika Seth, Chairperson, Haldia Municipality and other dignitaries, on 6th February 2008. Just after the inaugural ceremony the students who got positions in national level competitions were felicitated with prizes and mementos. The petals of RIVIERA ’08 was unfurled by the performance of Pandit Hariprasad Chaurasia on the first day who is known internationally as a player of the bansuri, the North Indian bamboo flute. Pt. Chaurasia is a classicist who has made a conscious effort to reach out and expand the audience for classical music. An all time great flute player, he is a living legend and a source of inspiration for the generations to come and ideal for the aspirants of music. On the second day there was an excellent performance from the Fusion Band “Tarang” leaded by Pt. Avijit Bandyopadhyay and the programme reached to its pinnacle by the performance of DJ Harish. On the third day there was performance from our college band Safron Saffire had us a different flavor of our own followed by the performance of the band “Prithibi”.